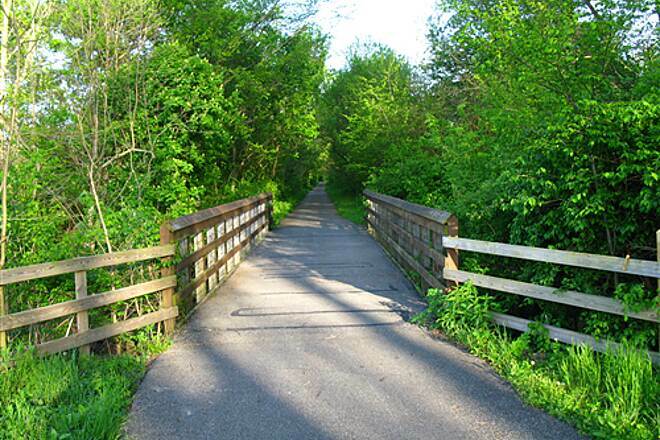 The Paint Creek Recreational Trail is the flagship pathway of a planned trail network in the Ohio counties of Fayette, Ross and Highland. 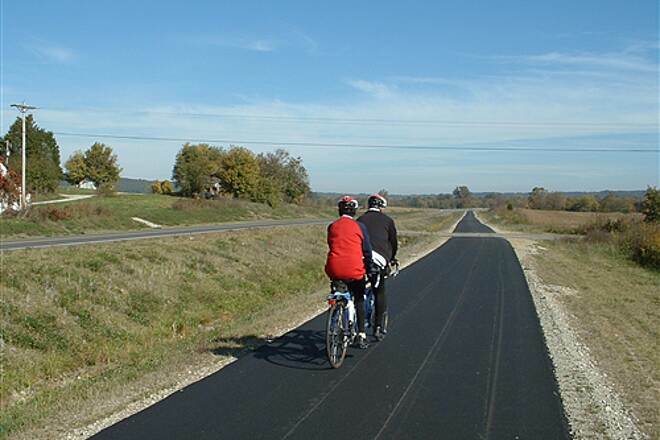 Nearly 35 miles of paved trail are currently open linking the communities of Washington Court House, Frankfort and Chillicothe. 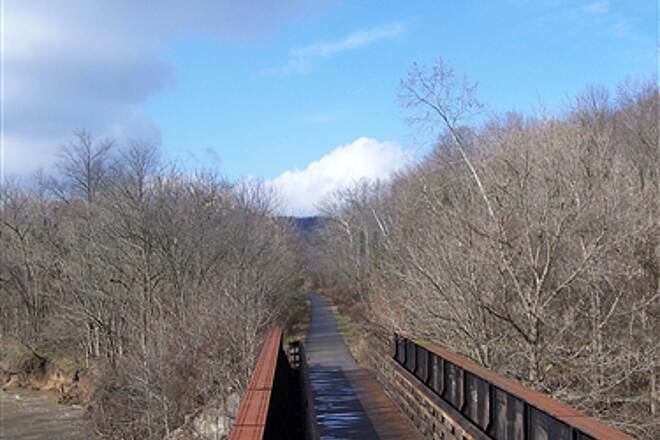 The vast majority of the trail occupies a former railroad corridor acquired by the local nonprofit trails group in 1994. 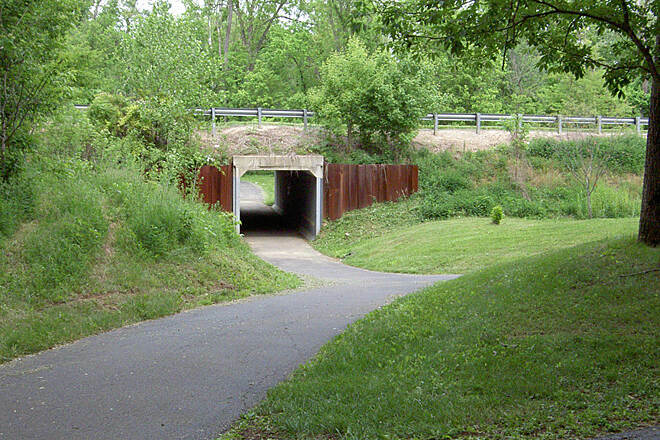 However, the trail does leave the original corridor where the right-of-way could not be acquired from its current owners. These diversions are generally brief, with the longest a 2.5-mile on-road segment on the eastern edge of Washington Court House. 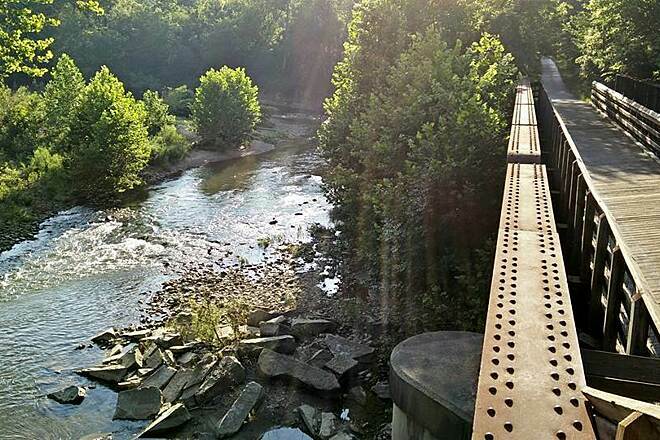 Because most of the trail passes through rural Ohio countryside dominated by seemingly endless farmland, trail users will be exposed for long stretches to the beating sun. 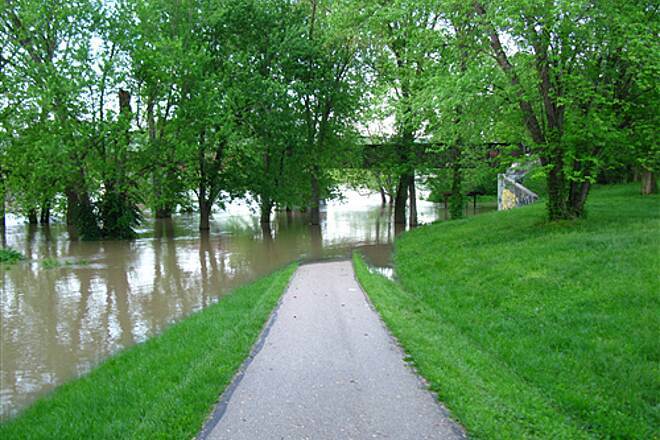 Fortunately, the path occasionally winds through a more wooded corridor adjacent to local waterways, such as Paint Creek and the Scioto River. 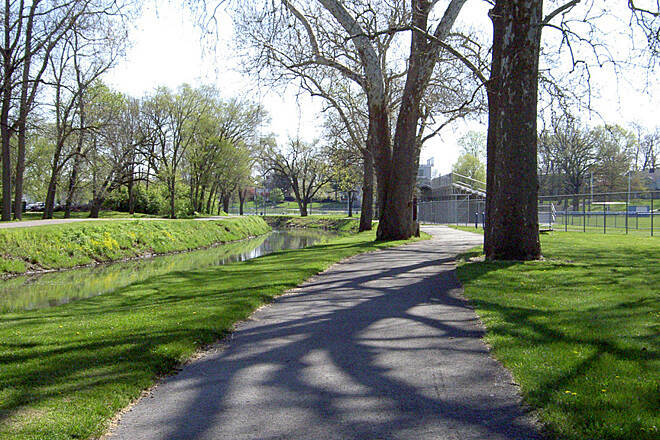 The Paint Creek Recreational Trail also passes through the downtown areas of the three towns along the way, offering ample opportunities for rest and replenishment. 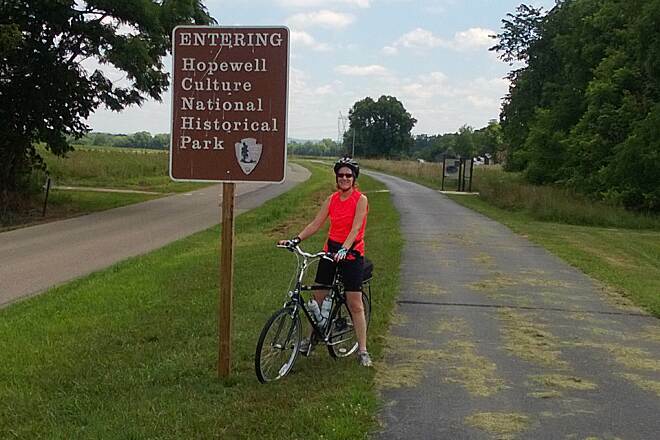 Just before Chillicothe, trail users will want to stop in at Hopewell Culture National Historical Park. 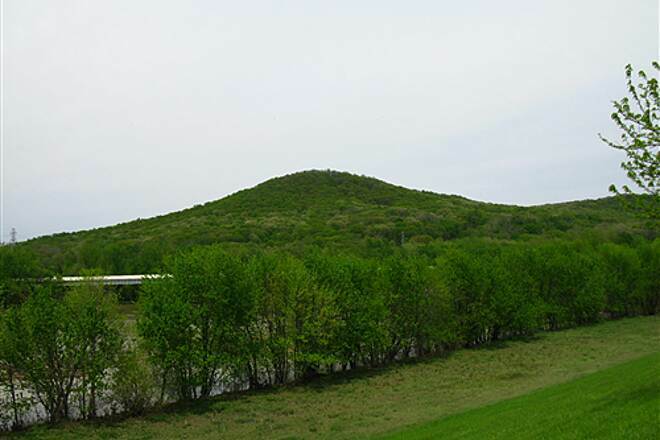 The Hopewell Mound Group, a portion of the park visible from the trail along Sulphur Lick Road, features earthworks and burial mounds built by local indigenous peoples nearly 2,000 years ago. 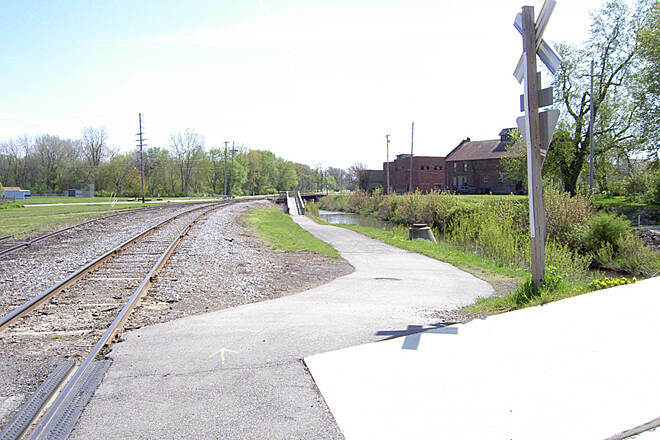 In the future, the existing Paint Creek Recreational Trail will be just one of many local recreational and transportation assets. 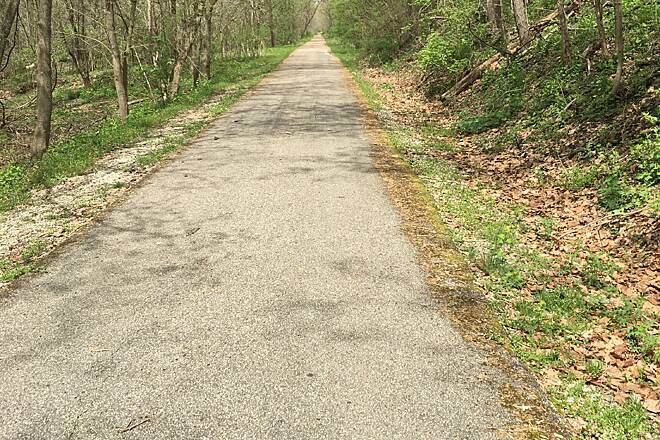 Plans are in the works to develop new trails along former railroad corridors from Washington Court House northwest to the existing Xenia-Jamestown Connector, southwest to Wilmington and east to Circleville in Pickaway County. 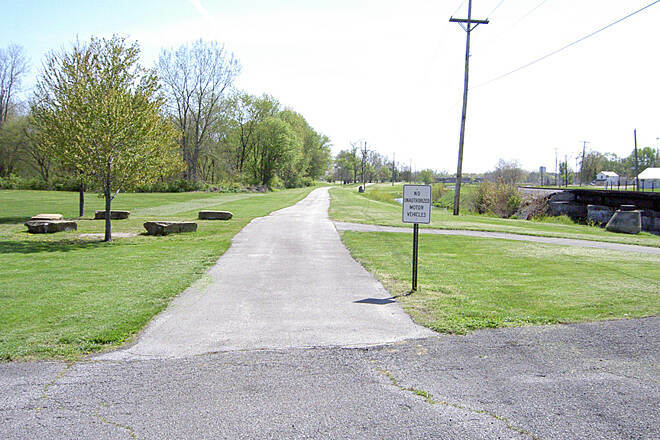 Parking for the Paint Creek Recreational Trail is available in Washington Court House at Christman Park on Elm Street or Sycamore Street. 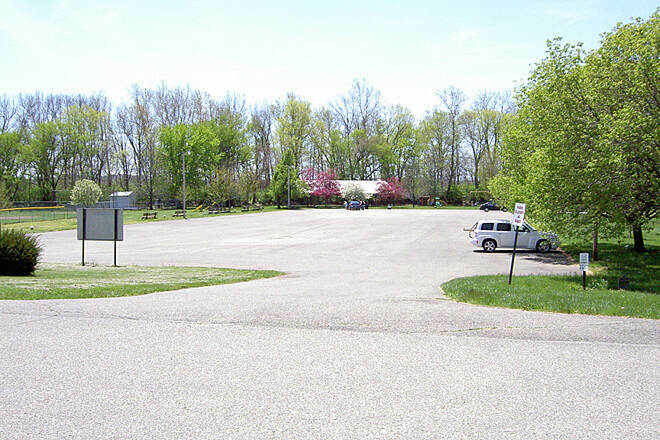 Northwest of Frankfort, limited parking is available at a trailhead at the junction of State Route 138 and County Road 29/Austin Road. 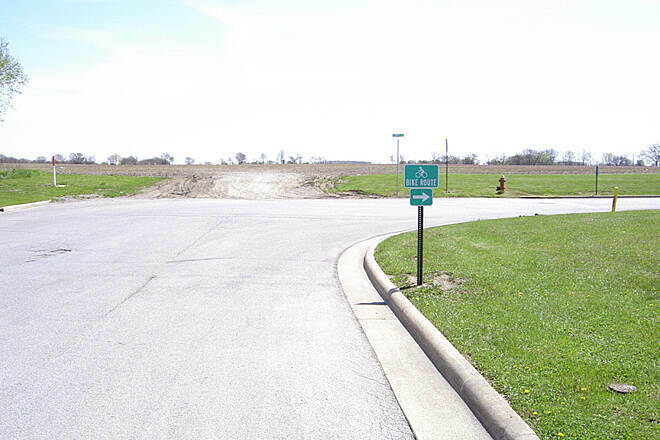 To access trail parking in Frankfort from US 35, take County Road 87 south towards Frankfort. 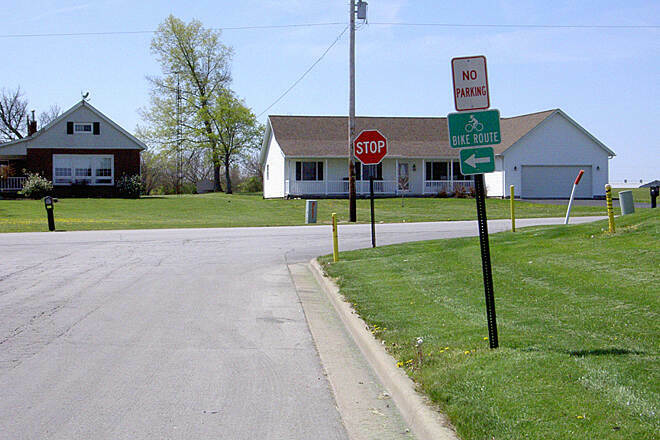 Turn left at the first stop sign onto High Street, then turn right on Main Street at the next stop sign. 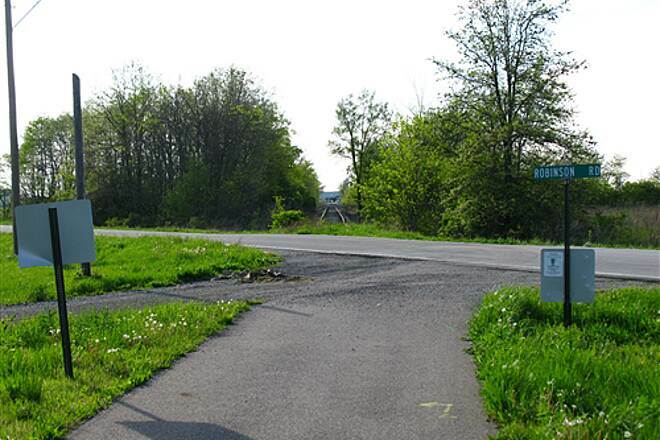 Continue south on Main Street to the next stop sign and proceed straight ahead about .25 mile. 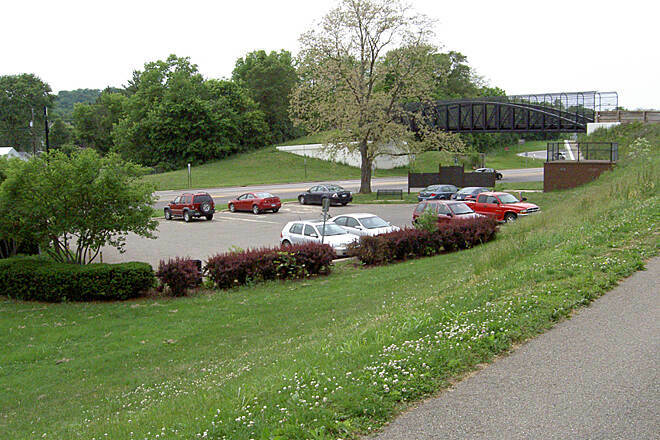 Parking is on your left just before the bridge. 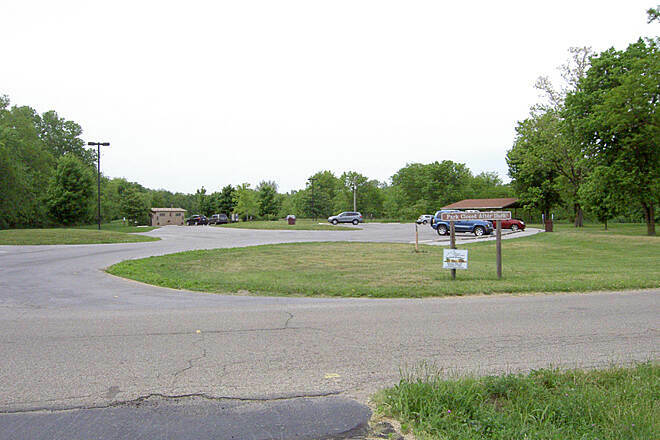 Just west of Chillicothe, parking can be found at the Hopewell Mound Group portion of Hopewell Culture National Historical Park near the intersection of Sulphur Lick Road and Maple Grove Road. 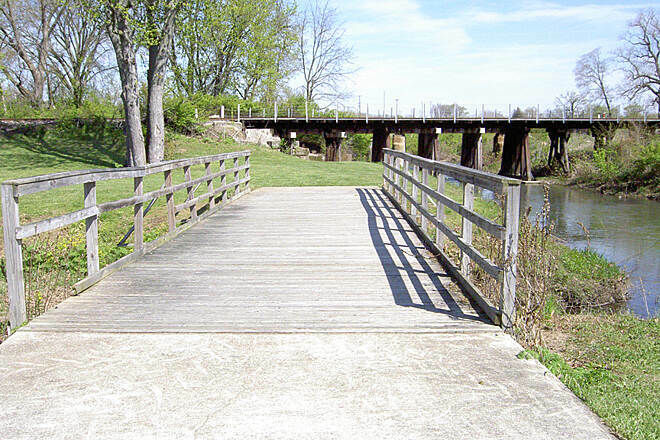 In Chillicothe, park at the northern end of Tiffin Avenue; a trailhead on SR 104 south of US 35; or a lot on Poplar Street near the Scioto River. 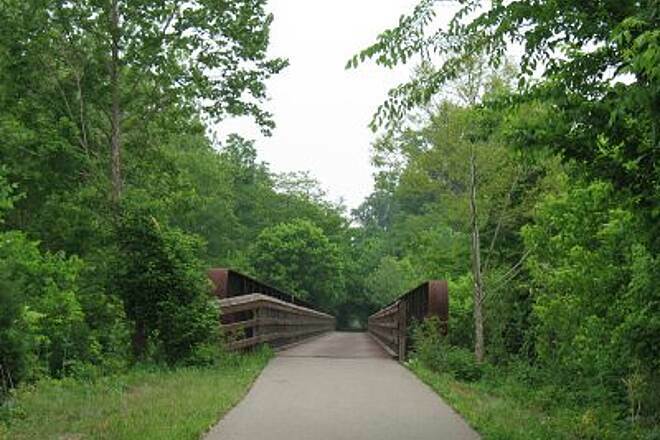 Rode this morning from outside WCH at the Wetlands, to Frankfort, about 30 miles roundtrip. 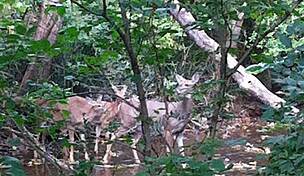 Nice group of volunteers wanting to improve the trail surface which has been rutted due to roots from adjoining trees. Too bad the Country does not do more to keep this up and provide maintenance. 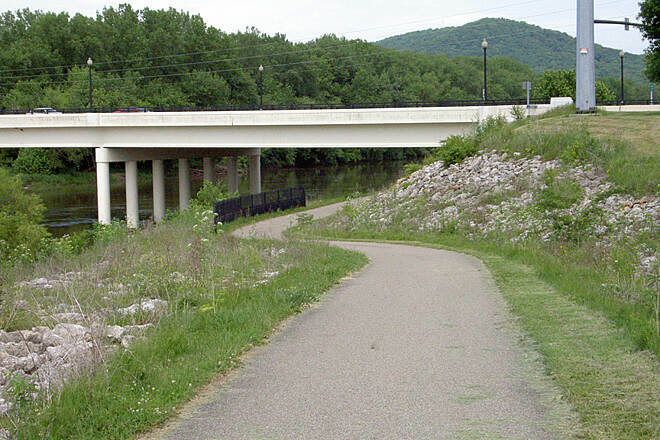 I mean I came from Texas to ride this trail with my nephew, and spent some money in the local towns. 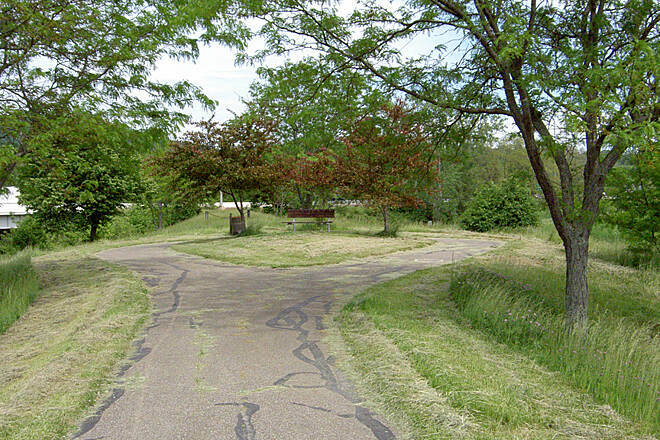 Very nicely mowed and maintained rest stops. 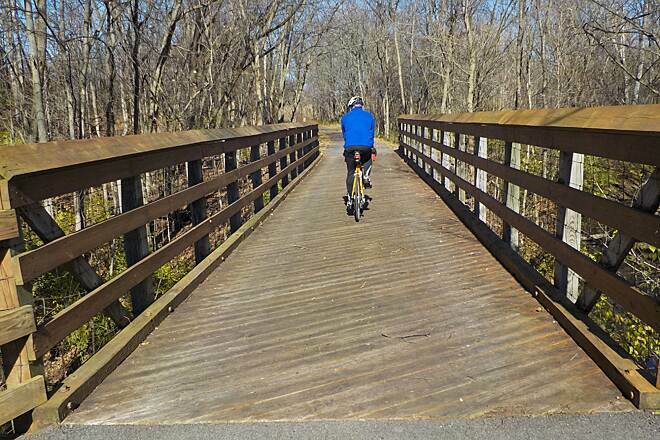 A friend I meet on Camp Chase trail recommended the Tri County Triangle trail and we found it to be an interesting ride. 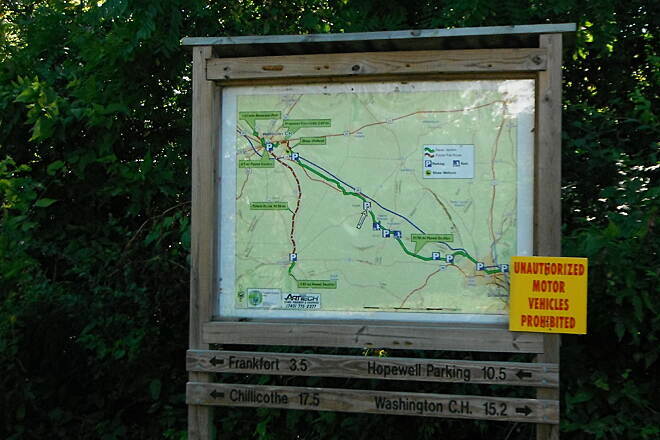 We rode it to Frankfort and the old school house and returned to the trail head. Our thoughts are that the covered bridge and Llamas was a good beginning but found the trail to be a bit bumpy and in need of repair. Lack of rest facilities with accommodations' was a concerned for my female biking partner but all and all we enjoyed the ride much and will ride it again. Rode this from Washington Court house to Chillicothe. While there were a couple spots through Washington Court House that slowed me down, but the signage was good and once out of town, it was a pleasure ride and be away from traffic! 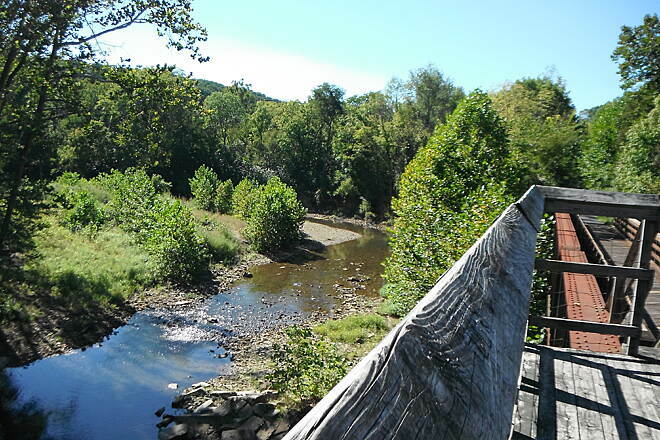 After many miles riding with traffic constantly coming and going, quiet bike trails offer a whole new perspective and give you the chance to take in the landscape, architecture, and wildlife as you enjoy the peace and quiet..
Another bonus trail for me on my cross country ride, one I'm sure the locals enjoy often! This route was rough with divits and holes. It was poorly marked where the trail would come to a stop at the road and you are left wondering, and searching where it picks up again. I had to get my phone out and look at a map of where it could possibly be located. Lots of glass shards where the path runs along the highway. 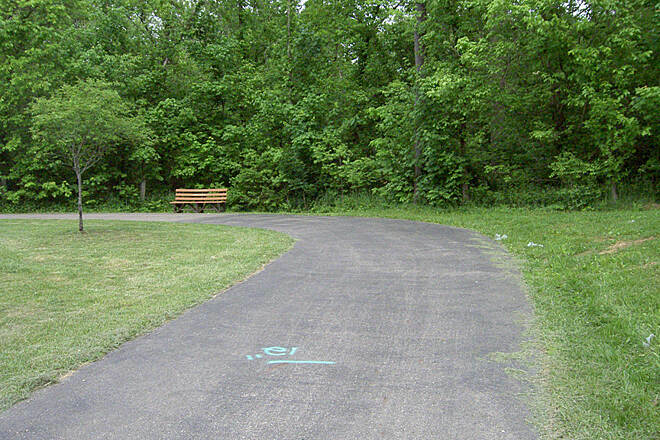 I had my first flat on this path. I LOVE THAT TRAIL IT IS A BEAUTIFUL RIDE. I GO TO FRANKFORD AND BACK. THERE ARE ALOT OF HOLES ALONG THE WAY, BUT HAVE BEEN MARKED. WISH WE COULD AFFORD A BLOWER THAT YOU PULL BEHIND A TRUCK. SAW ONE IN GREEN COUNTY. IT DID A GREAT JOB. 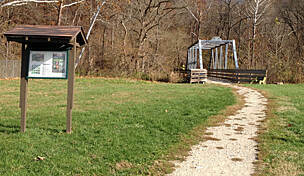 DOES ANYONE KNOW WHEN THEY ARE STARTING ON THE CLINTON COUNTY TRAIL? ITS STARTS IN SABINA TO REESEVILLE? IT WAS SUPPOSE TO BE FINISHED THIS SUMMER, BUT HASNT STARTED YET. I HEARD THAT THEY WERE WAITING FOR THE BIDS ON THE ASPHALT TO BE DONE? 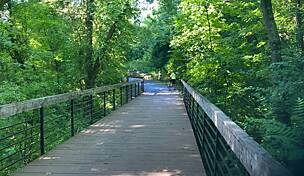 IT WILL HOOK UP TO THE FRIENDSHIP TRAIL IN WCH AND WILL GO TO WILMINGTON. CANT WAIT!!!! BEEN PRAYING A LONG TIME FOR THAT ONE. I FEEL SO LUCKY TO BE AROUND SO MANY BEAUTIFUL TRAILS. HOPE SOMEONE HAS SOME INFORMATION FOR ME. Whoever did the map of Chillicothe does not know what they are doing. 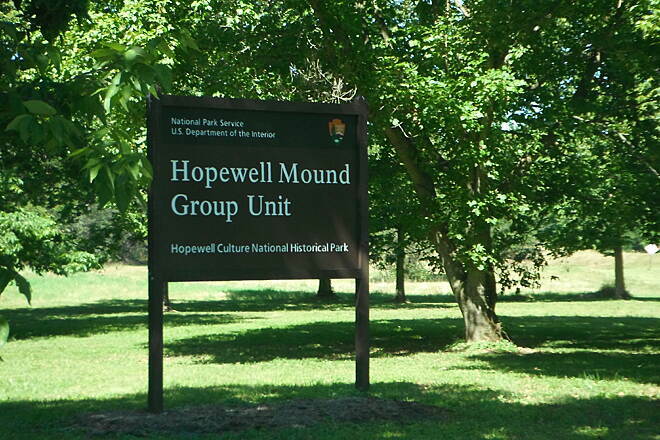 My 11 year old son and I started at Hopewell Mound. We rode about 15 miles. 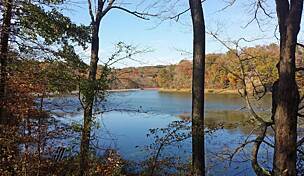 It was a cool sunny day, temps was around 70s. 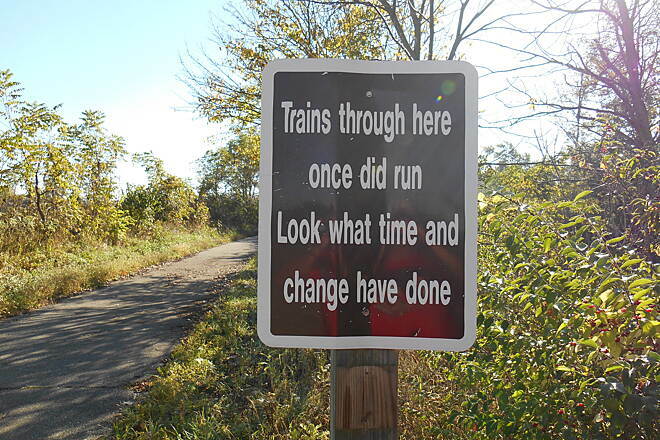 The trails needs a bit of maintenance. There were rough areas where the roots are starting to come out of the path, looks like mother nature is trying to take over. Other than that, it was a nice and quiet ride. There were a number of folks that I saw riding as well. I wish that more people use these trails because this is one of the nicest way to see the country and for the most part, it's free! I would definitely come back here, maybe during the fall colors. 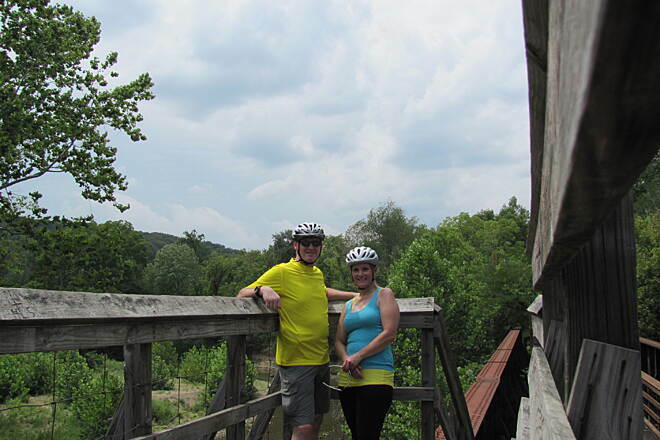 We rode the trail on Friday, starting in Frankfort and rode to Hopewell National Historical Park. This was about 7 miles. Nice trail, we rode in the shade about 60% of the time and in the sunshine 40%. 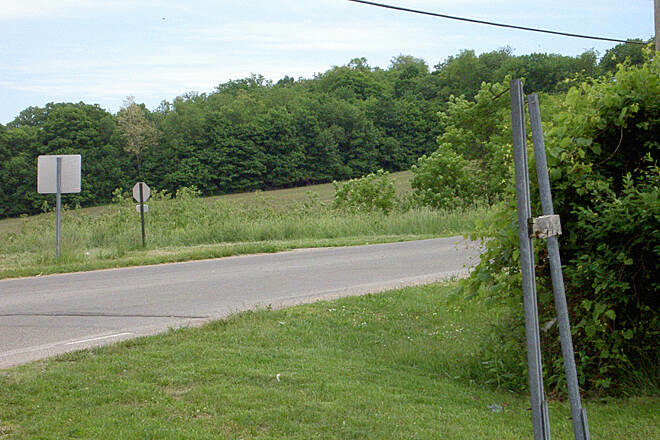 We then rode back to Frankfort and found the Dairy Cone about 2 blocks from the trail on 15 Springfield St. 45626. 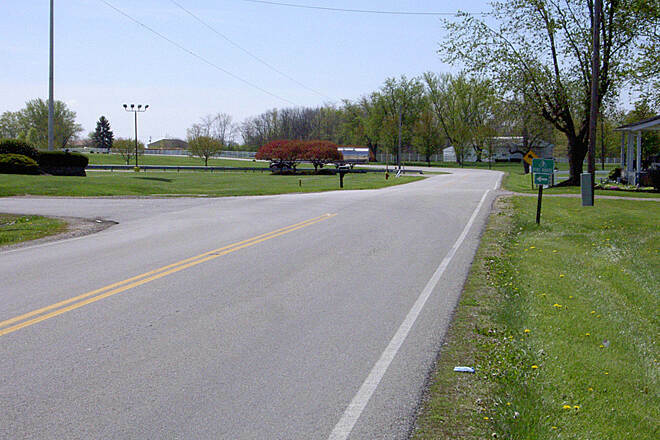 After this stop we rode toward Austin, turning around after passing the Adena Schools. 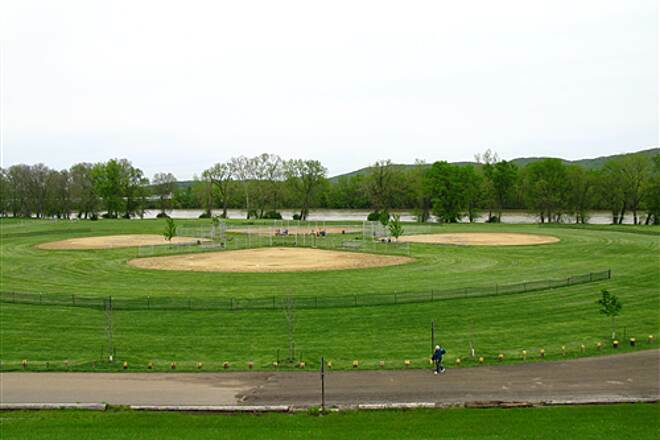 Next time we hope to make it all the way to Chillicothe. 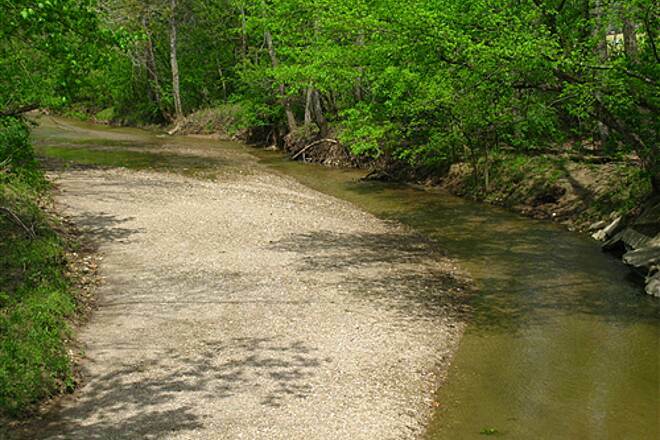 If you need a place to say when you are in the area, we would recommend the Lodge at Deer Creek State Park. 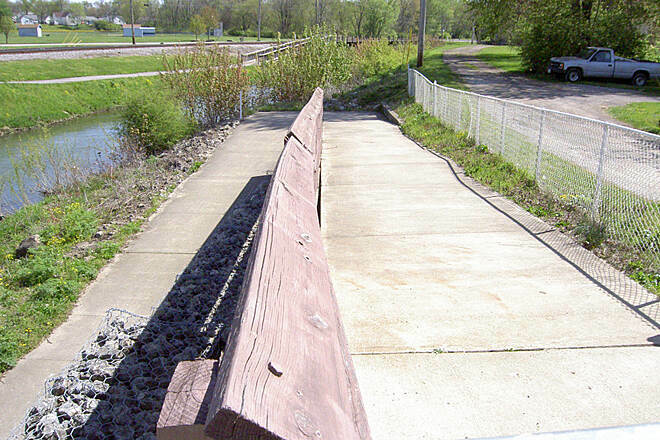 I have rode this trail several times, and my experience has been the same both times. 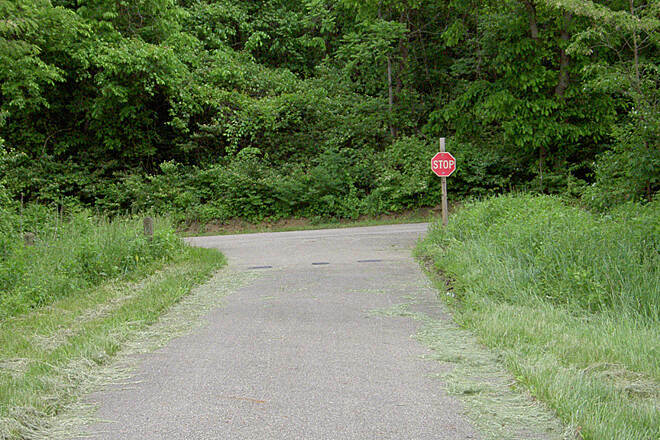 The signage as to where the trail goes when reaching intersections or trail forks is almost non existent. 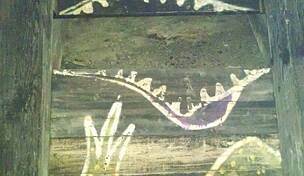 A couple of places you might see an arrow in the ground. 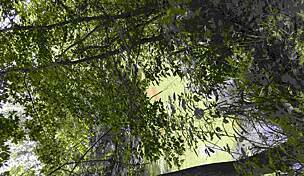 It can also be dirty with tree branches at times however not enough to ruin the experience. Traffic is light on the trail works good for working on drafting with fellow cyclist. Nice scenery however I would avoid on very windy days. Had a nice ride, weather was great. 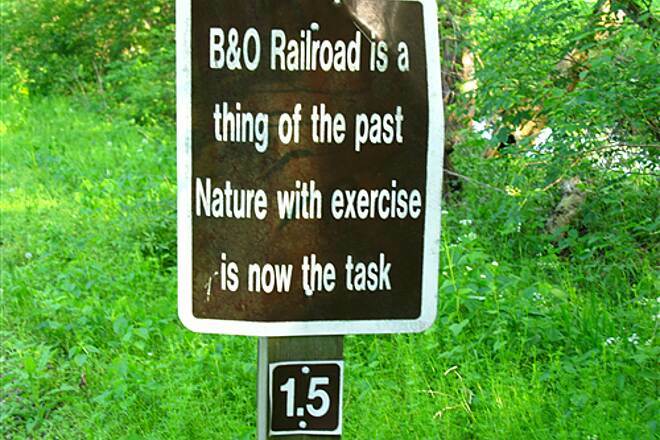 Trail could use more signage! Had another rider not assisted us, we probably would not have known where to go. We parked at the north side Robinson Road lot, and rode all the way to the south end. We have enjoyed the rides in Ohio, many more to do than we have here in Indiana. Just wanted to add this info. 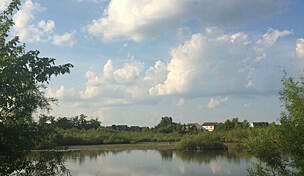 I parked in the little wetlands park east of WCH and rode to Chillicothe. 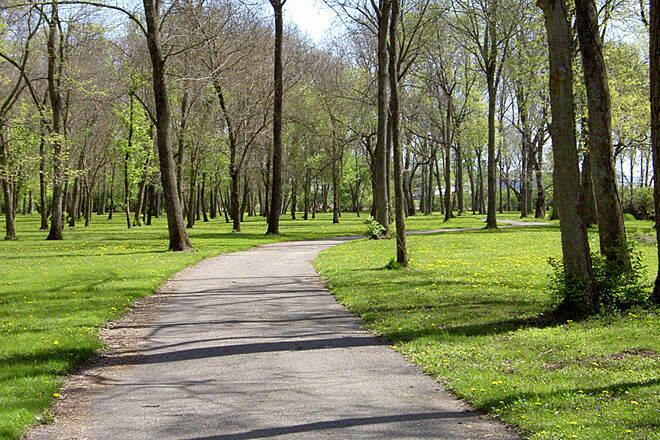 Very nice trail. Have to agree with another post. 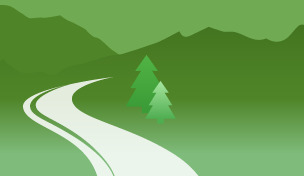 Bring a map for some of the road sections. 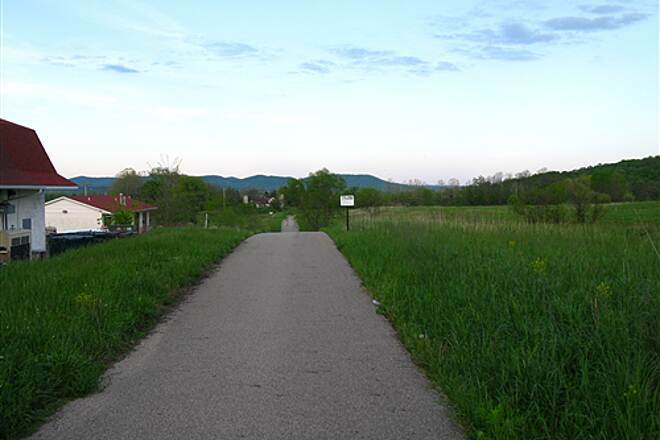 I even had the $10 rails to trails plug in for my Garmin, but is was inaccurate and useless. 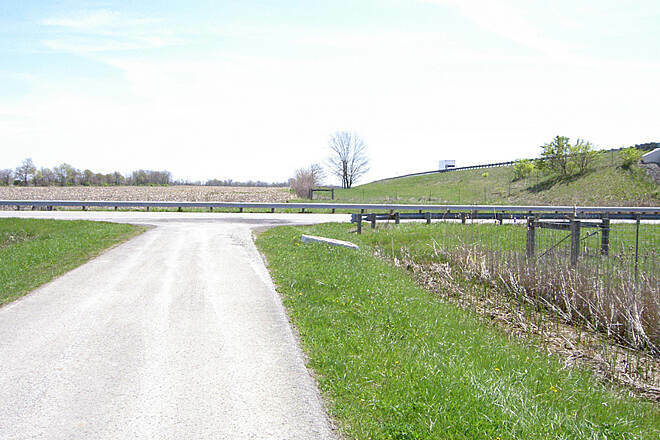 There's one road section near Chillicothe that we got lucky and followed another rider. And then just west of Chilli there's was an interection in the trail. We turned left with the help of my Garmin. If I didn't have it - it would have been a difficult choice. 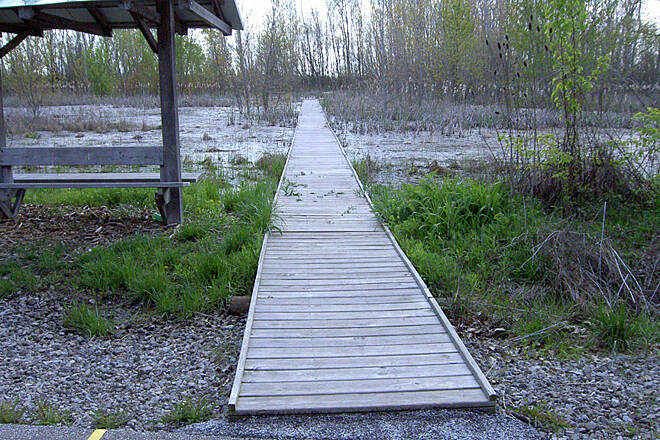 Nice trail! More shady than indicated by another post. 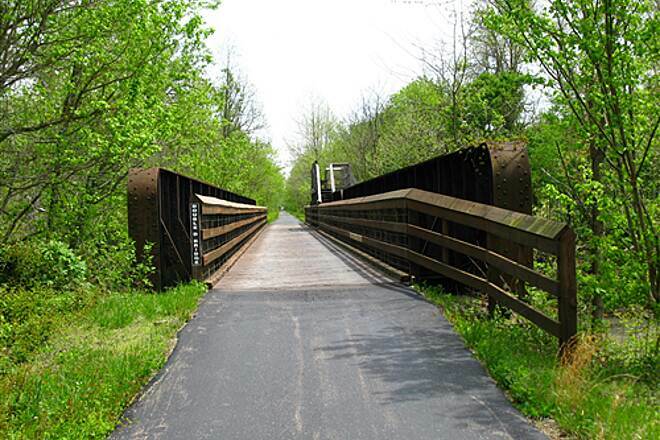 I rode this trail on a Sunday afternoon and was looking forward to a nice round-trip from Washington CH to Chilicothe. I took me three different tries and about half an hour to figure out what "roads" to travel on in order to make it to the actual trail. 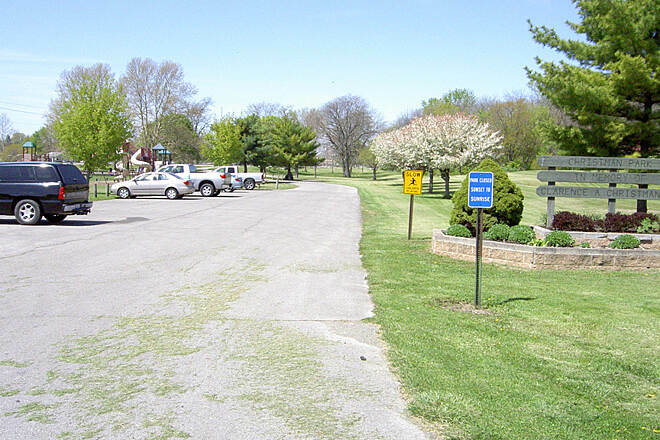 I parked at Christman Memorial Park and attempted to make my way from there. Thankfully I had my phone and was able to look up the map to find my way. It stormed most of the afternoon so I decided to bag the trip once I got a few miles into the trail, but I would definitely like to give it another shot. 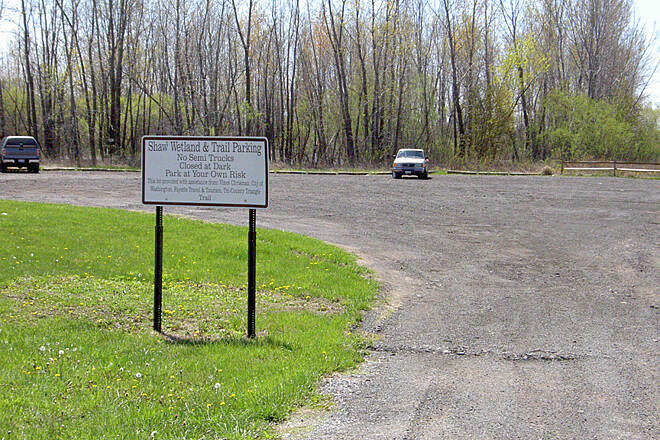 Next time I will just park at the actual trail head and skip the ride through the Washington CH industrial park. 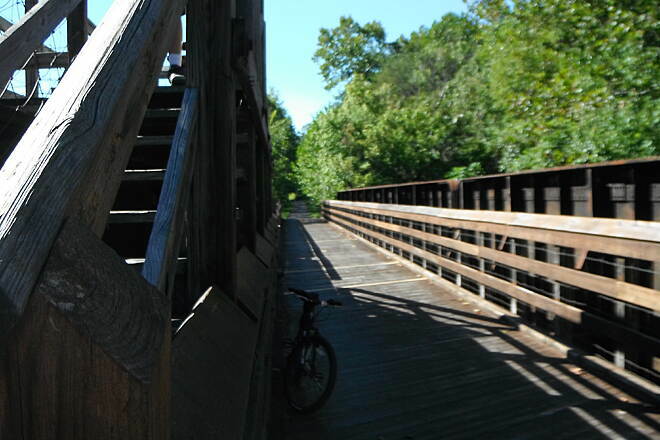 Having ridden the longer 38.6-mile (round trip) section between Austin and Chillicothe in April (see my review below) I returned today to ride the shorter 10.6-mile (round trip) western section near Washington Court House. 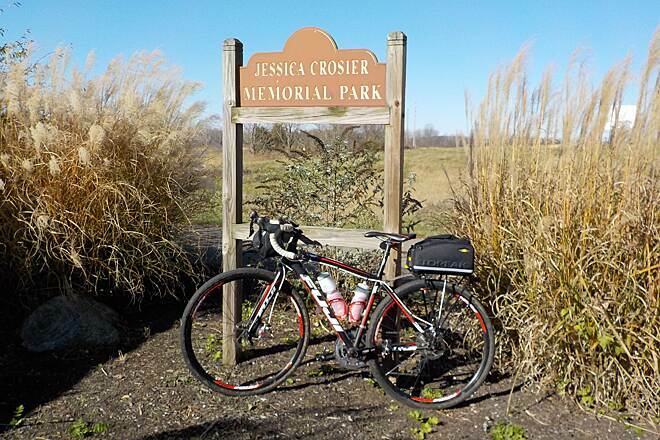 I parked in the dirt lot at the eastern end of the trail near the Shaw Wetlands and rode east and then west. 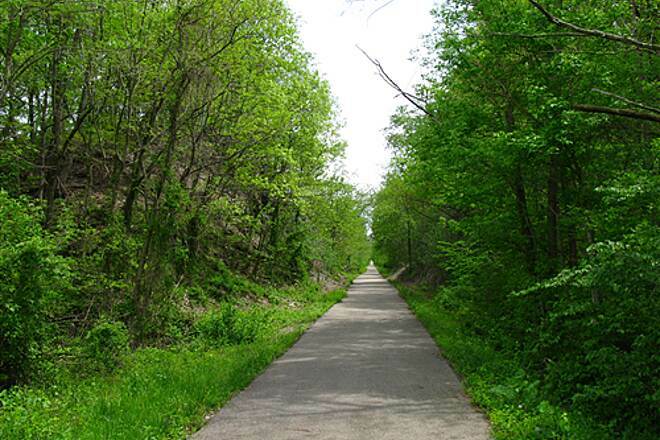 This section of the trail was entirely along a railroad bed with lots of old wooden railroad ties strewn to either side of the trail which, in my opinion, added to the railroading ambience. 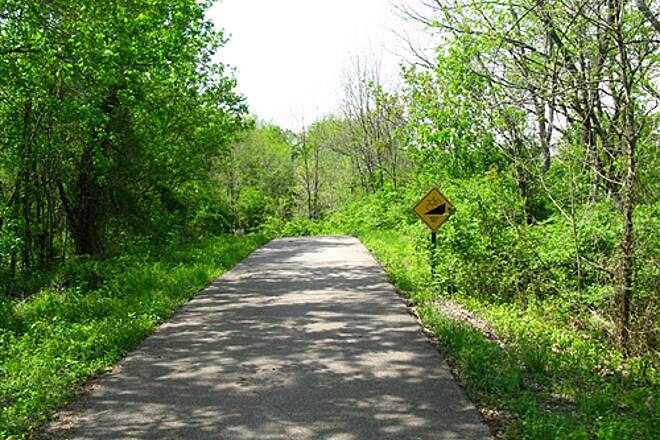 The trail is completely level except for several dips where it crosses the backroads and is only about 10% shaded. But what is shaded is very nice. 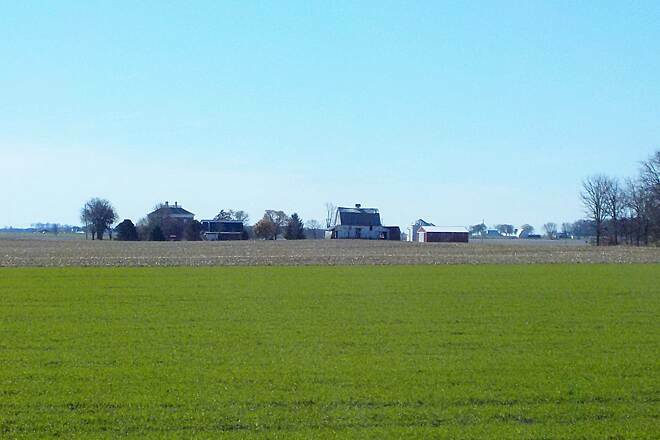 At first the trail runs behind a few properties and then eventually gets out into the country. Overall, an average ride right now but it will add a very nice extension to an already excellent main trail. 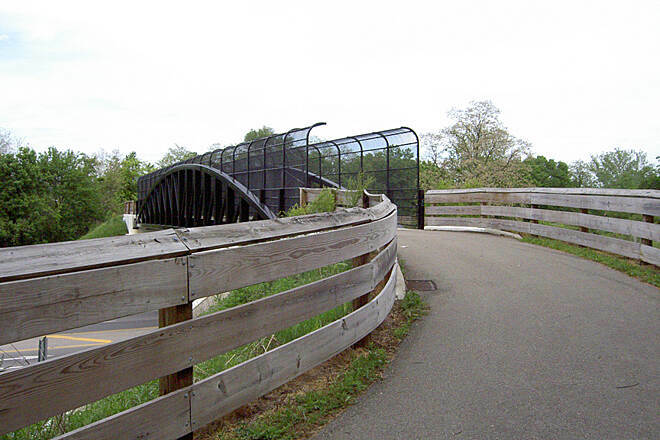 I will return to ride this trail again once the unpaved section connecting these two segments is finished. I also rode the main trail again after riding the shorter section above. 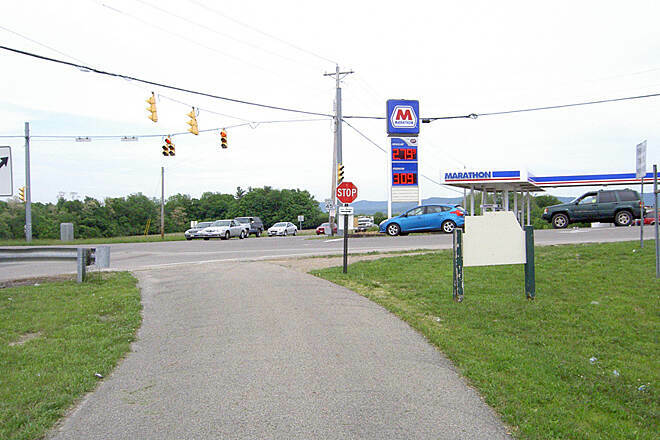 As one reviewer pointed out below, at one point the trail stops across the street from a Marathon gas station and picks up behind it. There you will find the best whoop-di-do on any trail and I leave you with this challenge: If you can start from behind the Marathon station, go down the whoop-di-do, and coast all the way out to the road where that section ends, post a review. I couldn't quite do it but am sure that someone can. 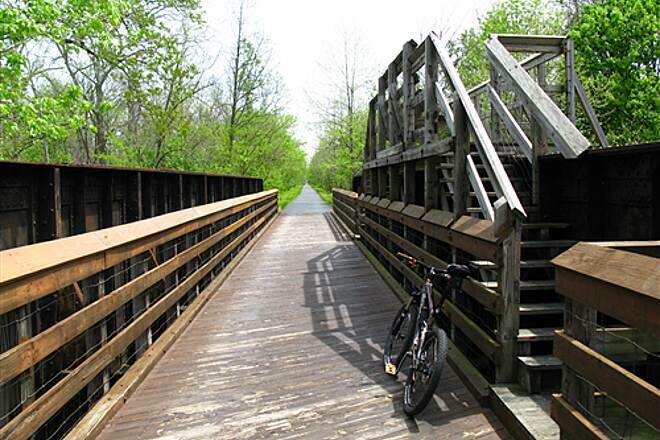 I have ridden 1,200 miles of Ohio rails-to-trails and the Tri-County Trail is, in my opinion, an excellent paved trail. 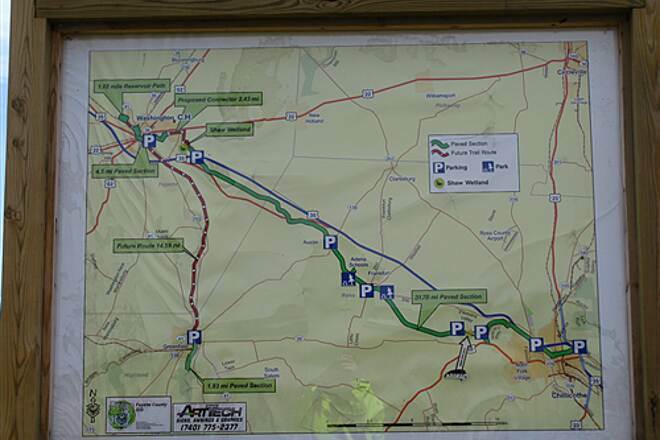 The main stretch of the trail runs from Austin, OH (N39-26.207, W083-13.343) at the western end where paved dedicated parking is available through Frankfort, OH (N39-23.985, W083-11.019) where paved parking in a park by the trail is available, to Chillicothe, OH (N39-20.642, W082-57.338) where parking is plentiful in Yoctangee Park and the eastern end. 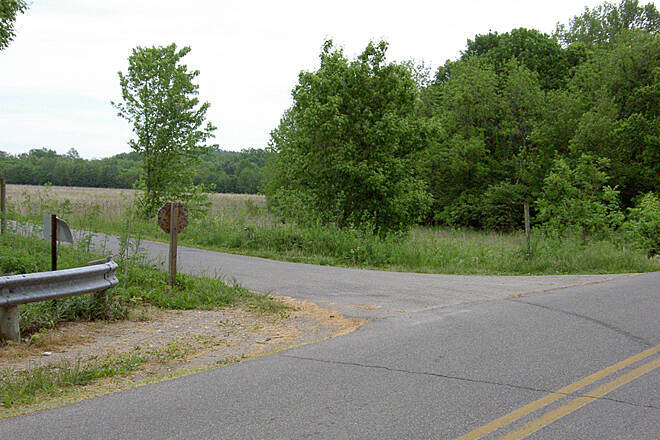 The distance of this section is 19.3 miles one way or 38.6 miles round trip. 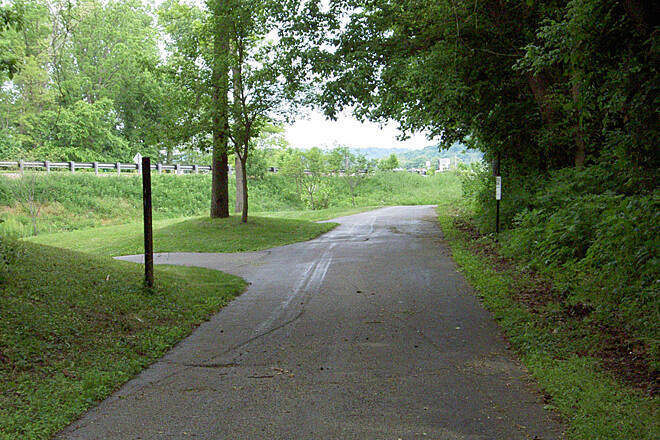 The eastern extremis of the trail is a loop in Chillicothe where the floodwall meets SR-23. 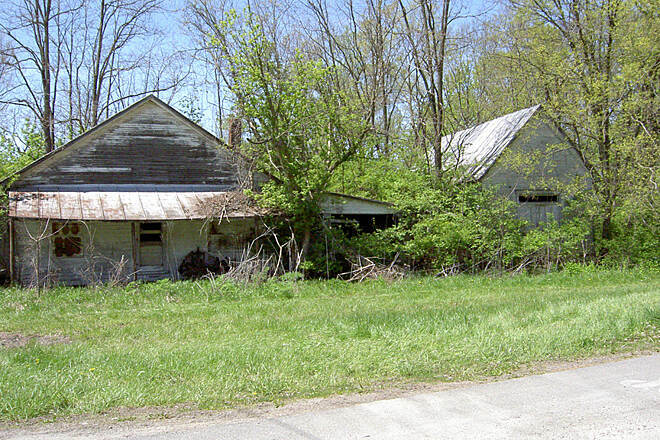 It’ll be very evident when you reach it and it’s within a stone’s throw of SR-23. The western extremis is in Austin. 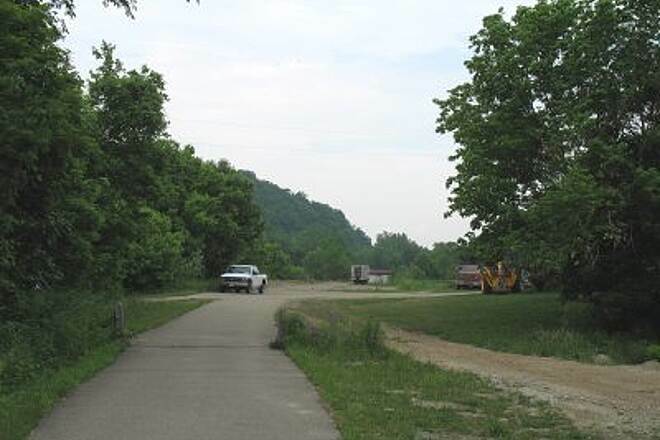 I parked in a little park next to the trail in Frankfort. 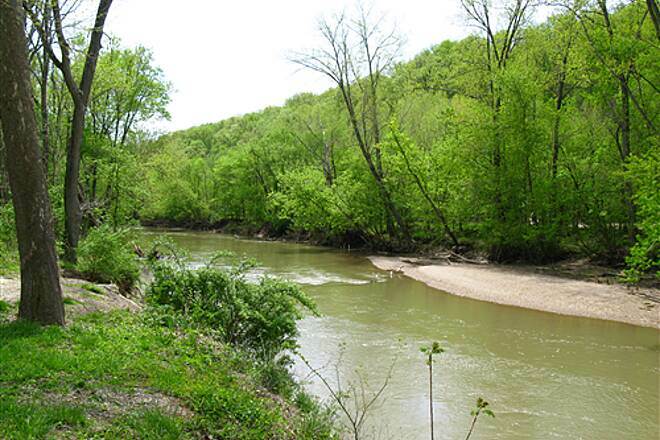 The land in this area slopes about 2 degrees downhill from Washington Courthouse down to the Scioto River in Chillicothe for the trail follows Paint Creek down to the Scioto and then follows the Scioto through town. 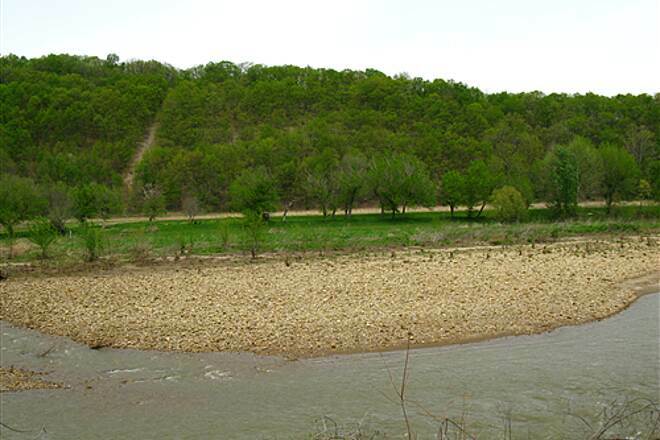 About 90% of the trail slopes down so it would be best to park in Yoctangee Park in Chillicothe, ride uphill 19.3 miles to Austin, then back down, with the wind, to Chillicothe. 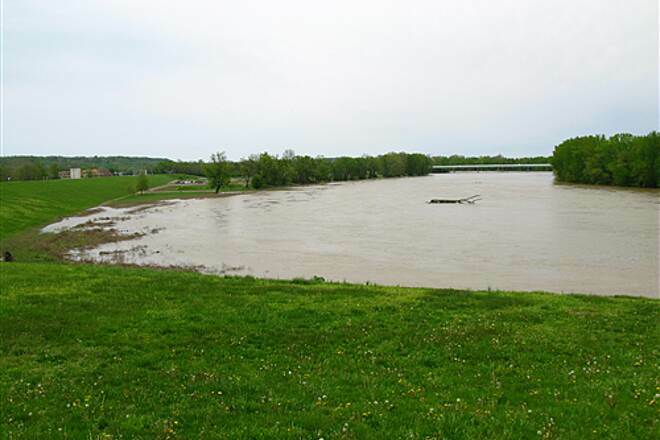 The last few miles are along the top of the floodwall with Sand Hill clearly visible to the north. West of Austin, the trail as of this entry is unfinished crushed limestone and even with 6” shocks front and rear, is a nuisance to ride. I don't advise doing it. 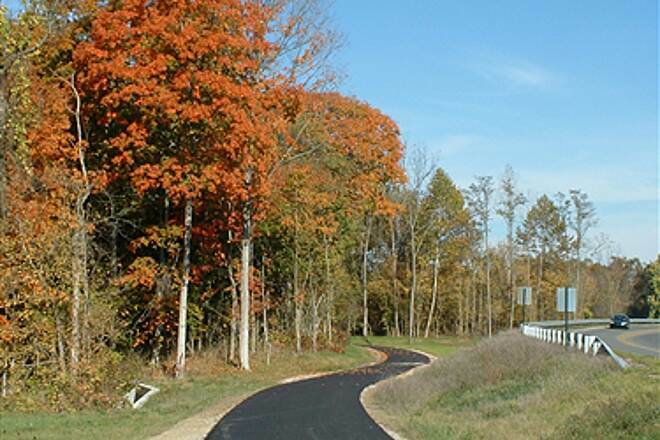 The 5.29-mile unpaved section extends from Austin west to Fairview Road (N39-28.790, W083-18.256) and from there it is paved for 5.33 miles to Robinson Road (N39-31.467, W083-23.135). 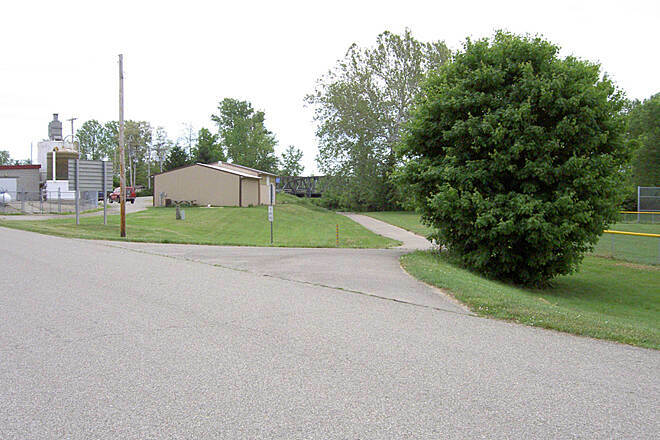 At that point, there is a dirt clearing for parking. There is absolutely no other parking along this shorter segment. 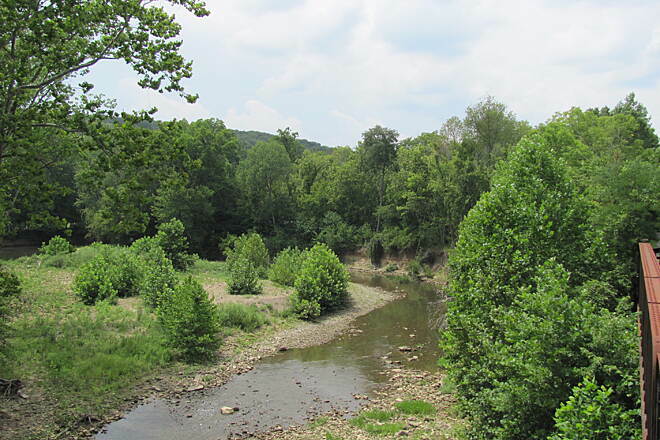 This trail is excellent for its length, scenery, shade, creek crossings, and solitude. 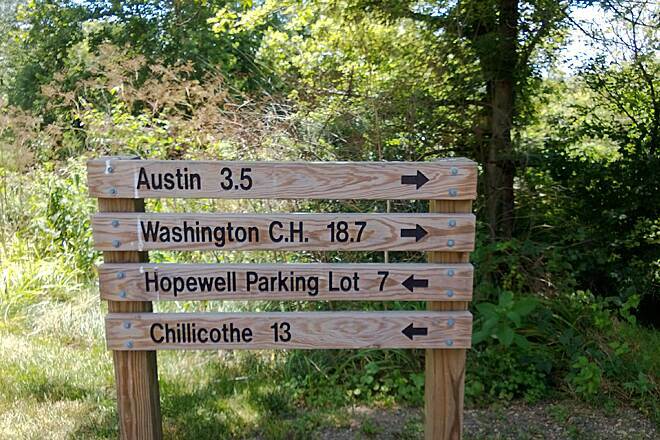 While the mileage is clearly marked on placards every half mile, there are nearly no direction arrows at all. 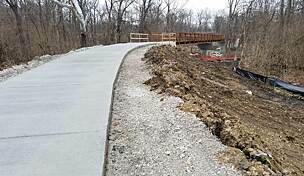 Once direction signs are in place and the unpaved section is completed, this will be an outstanding trail. Familiarize yourself with this trail on Googlemaps and with other rider's reviews before the ride to see where the turns are because the trail ends in places and then picks up down the road and around the bend so you won’t always see the next section of trail from where one section ends, but it's worth doing this. 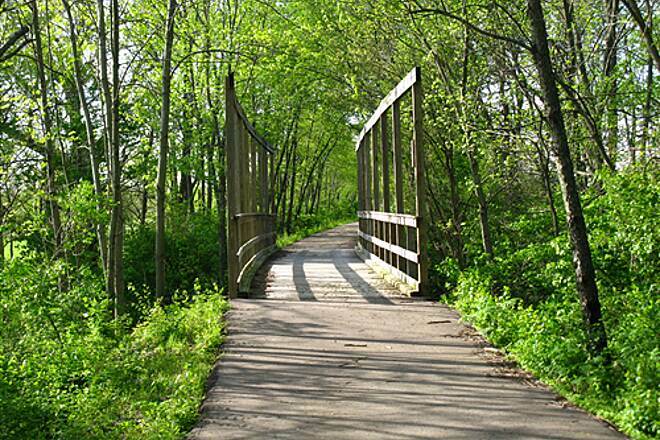 Make this trail a must-do on your ride list. 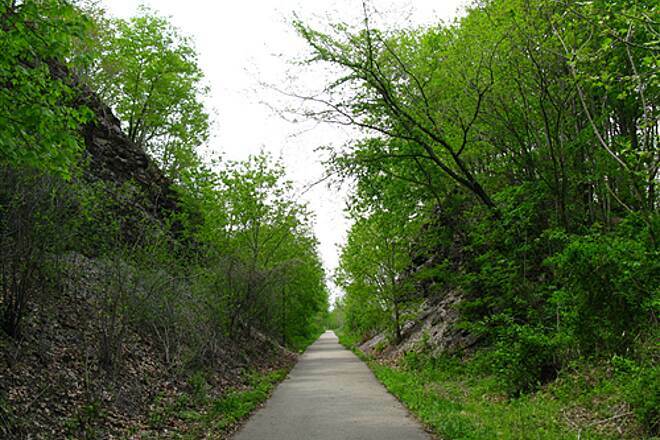 In my opinion, it is similar to the Hockhocking-Adena Trail, the TJ Evans Trail, and the Conotton Trail. I'll upload some pictures that I took today. 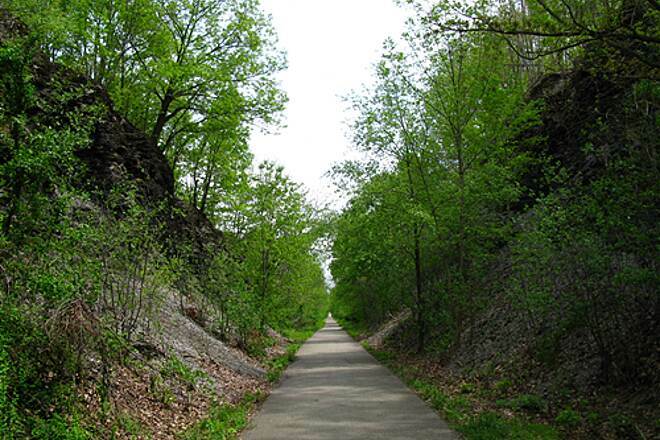 If you don't want any crushed limestone you will have to start out at the Austin trail head located just 1-mile south of Old St. Rt. 35 on St. Rt. 138 (once past 35, 138 will slowly begin to descend and the trail is more or less at the bottom of the decent directly on your left (Austin grainery will be right beside the trail head). 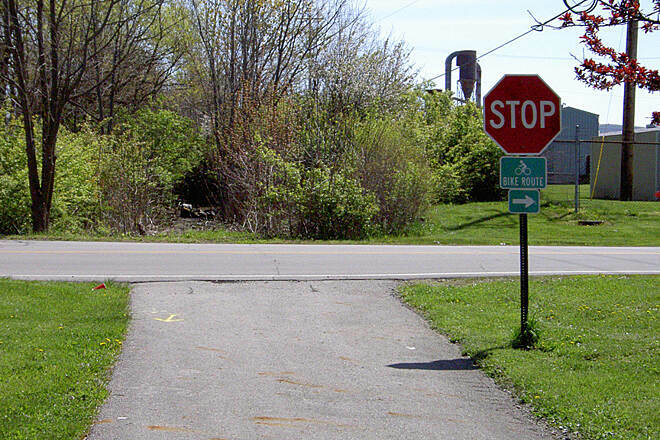 First, outside of the "trail rules" signs, there are NONE to guide you -- YOU ARE ON YOUR OWN. 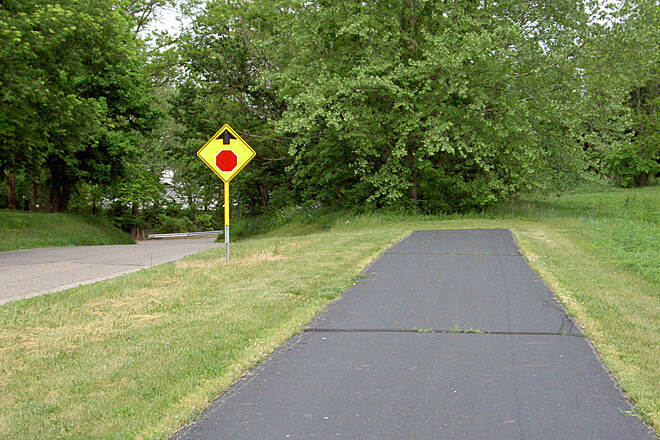 RTC needs to post signs, because otherwise the trail keeps coming to an end and you have NO CLUE as to which way to turn. 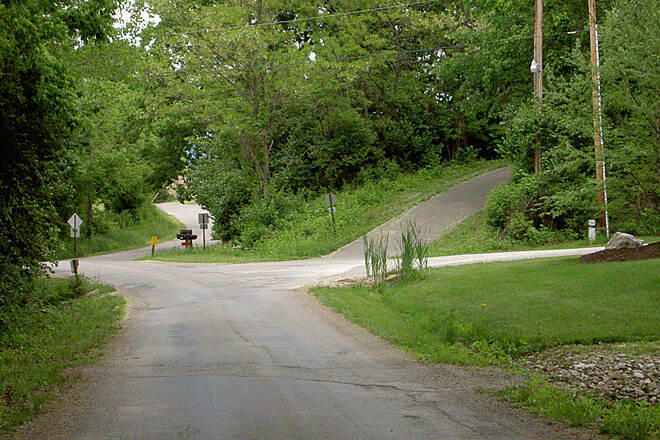 BUMPS: beware of the bumps along the way, the path is rippled with creased asphalt in places and you could trash your nice road bike in a heart beat -- be careful though and you will be just fine. 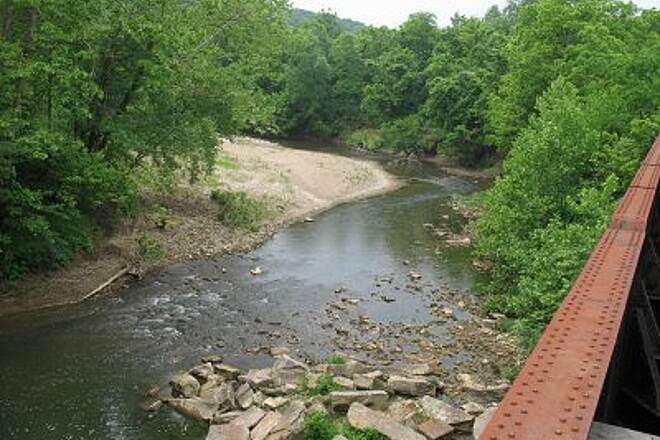 As you head out South (down hill 2%) on the trail it will take you all the way to Chillicothe right by the river. Coming back is around a 2% upgrade all the way back to Austin. Wind can be a big factor in the open areas of the trail. 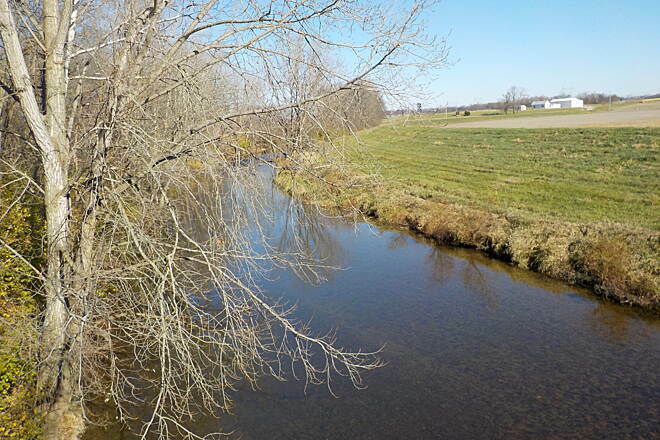 Scenery: I am sure, when the trees are full, it will look a lot nicer than it did in early April. 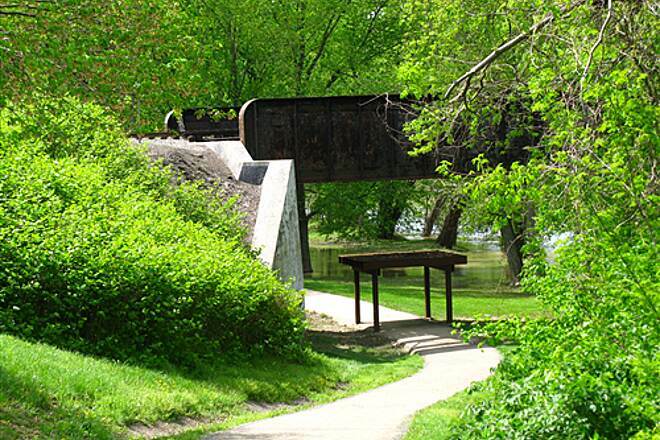 This trail does traverse along side the river and has some bench stops and overlooks on the bridges as well. 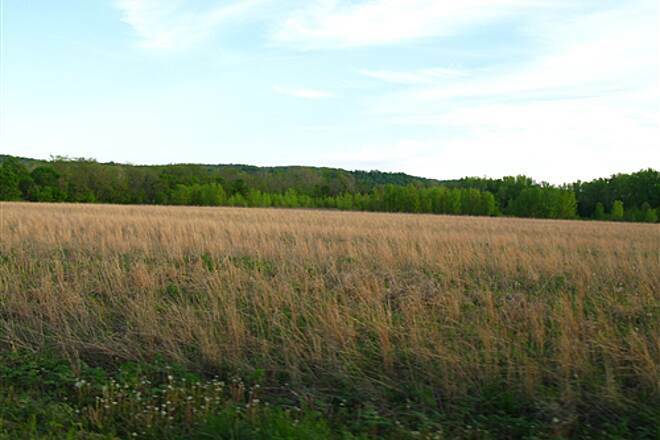 In summation, I will ride the trail again -- don't ask me why, I just will. 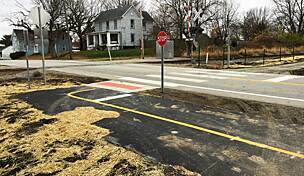 I presume the some of the wavy upgrades on the trail in place caught my interest? 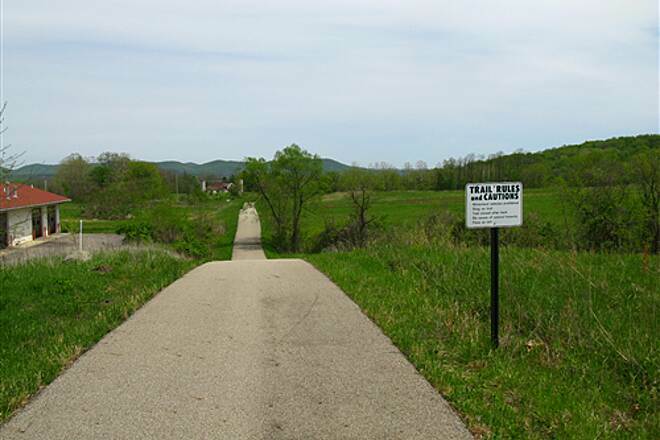 I encourage everyone to call RTC and tell them they NEED TO POST SIGNS SO EVERYONE CAN ENJOY THE TRAIL IN ITS' ENTIRETY WITHOUT GETTING LOST. 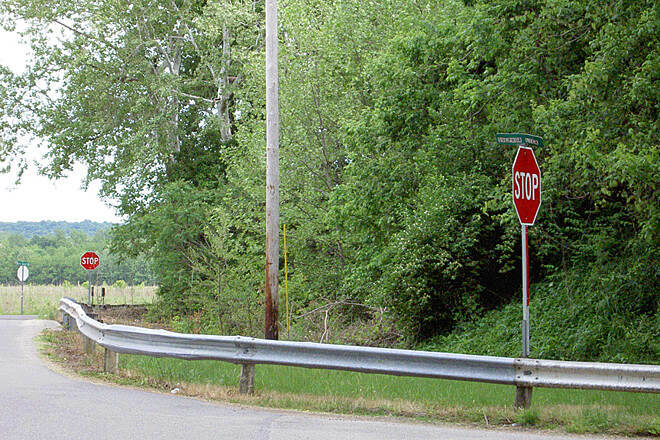 Oh, you may wish to know at least two little hints -- "when the trail stops at a gas station, it will pick back up directly behind the gas station. 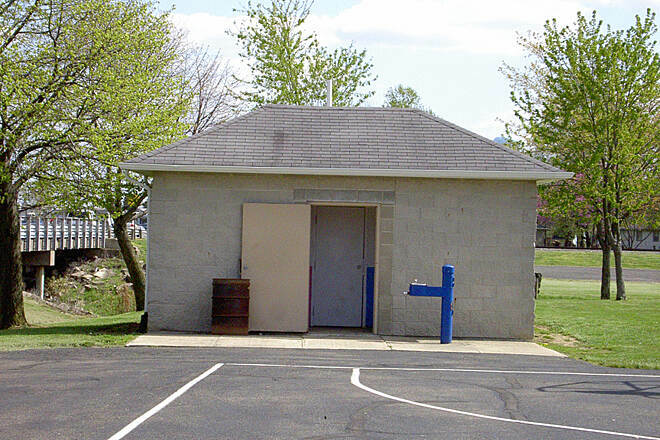 Next, when you see a tunnel, go under it, and stay on it, this will take you to this gas station. That's about all I can say. Good luck. 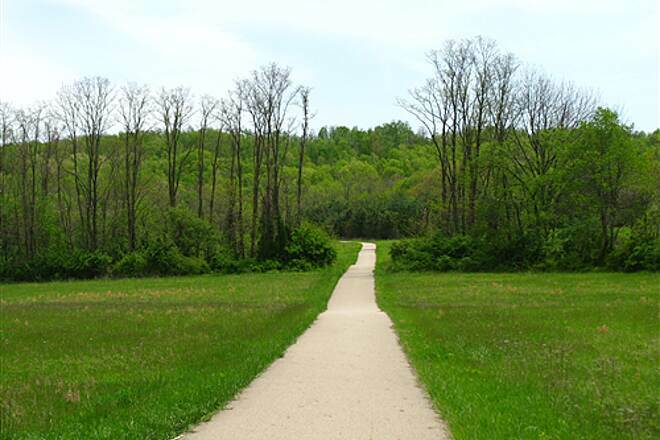 "You can see much of the diversity of southern Ohio on this nice, mostly flat trail. 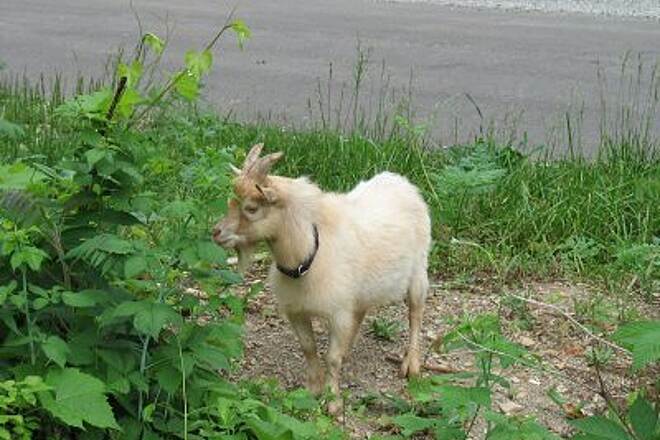 Watch out, though: The slightly uphill return trip to Frankfort can get ya!"